If you have been to the dentist recently or planning to visit, here is a question you most certainly will hear, how often are your flossing? For most people the answer is I’m not flossing or at least once or twice per week. Most patients do follow the brushing recommendation which is at least twice per day. 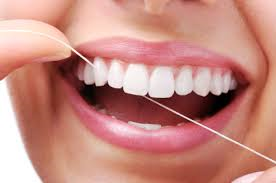 Most dentist and the American Dental Association recommend to floss at least once per day. Dr. Danial Kalantari of our Smiles on Bristol Dentistry office recommends to floss after every meal and at night time before going to bed. What are the benefits of flossing? The benefits of flossing can be many, removing plaque from in between your teeth, it can prevent gum disease, and halitosis. Flossing removes all plaque that’s left from food that get stuck between your teeth. Brushing only removes the plaque on the surfaces of the teeth but not in between the teeth. If the plaque is left for long periods of time in between the teeth it can cause caries and halitosis. Plaque also causes gum disease if left for long periods of time, it hardens up under the gum and becomes tartar and build up causing the bone to resorb. Flossing correctly is also very important. It is very common to hear people say that they don’t floss because every time they floss, their gums begin to bleed. It is common for your gums to bleed if you recently started flossing, this is because you already have gingivitis or gum disease. The bleeding and swelling of your gums should stop or reduce if you constantly floss your teeth. Flossing should be done gently and in between all your teeth. There is different alternatives to flossing on the market today. Water picks, toothpicks, and some electric toothbrushes. Our Smiles on Bristol Dentist Dr. Kalantari usually recommends his patients the traditional dental floss. Its price is very reasonable and it works just as good or better as the other flossing alternative instruments. If you have any questions regarding flossing you can always stop by our Santa Ana location, we would gladly teach you how to floss or give your free floss. This entry was posted in Uncategorized and tagged floss, Flossing, santa ana denistry, Smiles on Bristol on December 22, 2015 by Francisco Torres. Practicing dentistry without a license is considered a crime. Each state has different regulations but all require a dentist to have a valid license to practice dentistry. These laws are good for the consumer because it protects them from many issues they can face when they get dental treatment done from an unlicensed dentist. Many reasons people go to an unlicensed dentist can be that they are more affordable, he’s a family friend, or people are just unaware that the dentist they attend are unlicensed. Some unlicensed dentist have sophisticated offices or locations that people do not question or ask for license. Some issues patients face when they get dental work from an unlicensed dentist can be infections from non-sterile instruments, not getting diagnose correctly because of missing tools or equipment, or just malpractice. Sterilizing instruments and keeping a sanitary working place it crucial to stop cross contamination. It is very important to use disinfectant to clean operatory chairs because bacteria or viruses can be left there by previous patients. Having the proper tools and equipment is also important because it helps the doctor diagnose correctly and also gives a more accurate treatment plan. The most common issue is malpractice which is injury or poor quality dentistry. Some people look for the most affordable dental work and usually end up getting dental treatment from an unlicensed dentist. The work is usually less expensive because the material being used maybe lower quality, and most of the time it’s a quick fix not a long term solution. The treatment can also be affordable at the moment and in the long term more expensive if done incorrectly. It’s very important to think long term when getting any dental treatment done. This entry was posted in Uncategorized and tagged License, santa ana, Smiles on Bristol on December 22, 2015 by Francisco Torres. Baby bottle tooth decay are caries on primary teeth caused by liquids that contain sugar. When kids are put to bed or drink sugary drinks like juices, sodas, milk and other sweetened drinks in their bottle or sippy cup they have a higher chance of developing baby bottle decay. When these sugary drinks are being consumed through a bottle or sippy cup the sugar tends to attack the gum and teeth, and if the teeth aren’t being brushed they higher the chance of baby bottle decay. The risk also increase if children are being put to bed with bottle or sippy cups. 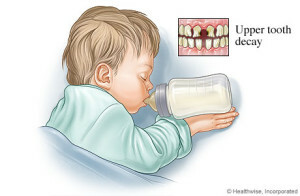 There are many ways to prevent baby bottle tooth decay. You can start by lowering the amount of sugars that are being consumed. Avoid juices, sodas, and sweetened drinks and give more water. If given milk brush your child’s teeth immediately and don’t have your child go to sleep with a bottle or sippy cup that contains sugary drinks. If your child teeth are just erupting you can wrap a moist gauze or cloth to massage the gums and gingival tissue. The primary teeth are essential in the eruption of permanent teeth. So if you child has develop baby bottle tooth decay it is very important to schedule a dental appointment with your dentist to treat the affected teeth. Every primary tooth has its time to fall, if the primary tooth is extracted or missing at a time where it’s supposed to be in the mouth, the spaces may close and the permanent teeth still erupt and can cause the permanent teeth to erupt in a crooked position or can become impacted. So it is very important to treat those affected teeth as soon as possible. 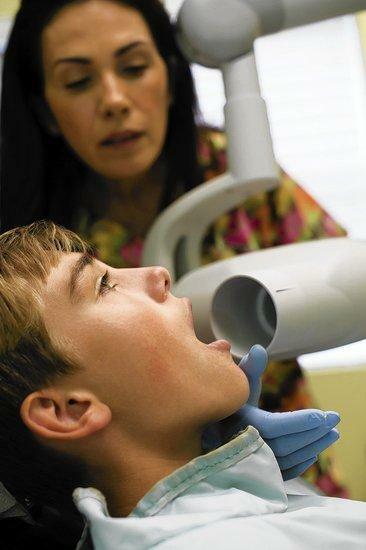 Other ways you can help your child is by taking him to his regular dental exams. Dental exams should be every 6 months and children can begin seeing a dentist before the teeth even erupt. Your dentist can help you create a plan on how to clean and maintain your child’s teeth. If you have any questions regarding baby bottle tooth decay you can contact your friendly staff at Smiles on Bristol Dentistry. This entry was posted in Uncategorized and tagged Baby Bottle Tooth Decay, santa ana, Smiles on Bristol on December 16, 2015 by Francisco Torres. We have all gone to the dental office for an exam, you begin with the paper work and then they call you in for your x-rays or radiographs. The dental x-rays help the dentist give a better diagnostic, x-rays can detect caries and other problems such as cyst or abnormalities in the mouth. The amount of x-rays depend on if you’re a first time patient or a returning patient. If you’re a fist time patient a full mouth x-ray will most likely be taken, this will give the dentist a better look of all your teeth. The amount of x-rays also depend on the age of the patients, children requiring less x-rays. If you’re a returning patient the amount of x-rays will be minimal. Some dentist also recommend panoramic x-rays this x-ray captures the entire mouth in a single shot. There is new dental technology that your dentist may be using in his office, an example is digital x-rays. Digital x-rays have revolutionize the dental field. With digital x-rays you are exposed to less radiation than the traditional x-rays. Digital x-rays are automatically sent to the computer rather than taking the traditional x-ray and developing in a dark room. There are many benefits in using this technology, your dentist can email or print, enlarge, and even compare images. The amount of radiation when x-rays are taken are very minimal. The radiation is focused on just the site and the dental walls have a shield from scattered radiation. The technicians are trained to take the best x-rays as possible to avoid retakes. When taking x-rays the assistant or x-ray technician will place a lead apron this helps protect the patient from the scattered radiation. All people operating the x-ray machine are trained and license to take x-rays. The amount of radiation from the x-ray unit is lower than background radiation. Background radiation is radiation from sun, soil, rocks, buildings, air, and water. It is very important to tell the x-ray technician if you are pregnant or expecting to be. Your dentist may just start with a visual exam and then continue with x-rays after pregnancy. This of course if the patient is not in pain or discomfort. This entry was posted in Uncategorized and tagged radiation, santa ana, Smiles on Bristol, x-rays on December 15, 2015 by Francisco Torres. Dentures are defined as a removable plate or frame holding one or more artificial teeth. Dentures replace missing teeth and tissue and can be in two forms,a complete denture or a partial denture. A complete denture will replace either all upper or lower missing teeth. A partial denture will replace some teeth from lower or upper mandible. Dentures play an important role on people that have missing teeth becuase it stops the bone from receding. It is very important to replace any missing teeth because it can cause more trouble on neigboring teeth. When teeth are missing it causes other teeth to shift or elongatemaking it difficult to brush and floss correctly, which causes cavities and periodontal problems. Molars and premolars are very important to the mouth, those are theteeth we use the most to chew, when you are missing molar or premolars you create more pressure and stress on the anterior teeth. This cause the teeth to chip or look worn out. and all tissues heal back to normal. Your dentist can also recommend a conventional denture when an old worn denture is in place and needs to be replace. dentures are usually an alternative to bridges. of the implants. This will give a more natural look and patients do not have to worry about their denture coming off. and talk to your dentist to see what options work best for you. This entry was posted in Uncategorized and tagged Dentures on December 11, 2015 by Francisco Torres. 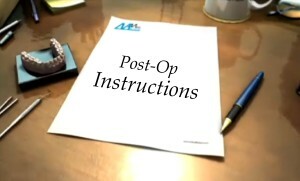 If you’re planning or you recently just had your tooth extracted, here are a few Post-Operative Instructions after Dental Extractions that will come in handy. First not all dental extractions are the same, everybody has different results after a tooth extraction. Some people feel no discomfort and other do, this all depends on the type of extraction and how well a person cares for their extraction site. After an extraction it is normal for the extraction site to bleed. The dentist will usually give you a gauze to bite down on the site, this creates a blood clot and stops the bleeding. The bleeding usually stops a couple minutes after you apply pressure with the gauze. 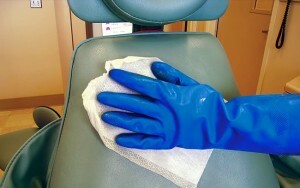 The gauze is changed every 15 to 20 minutes or changed when it’s heavily soaked with blood or saliva. It is very important to not disturb the blood clot, if the blood clot is disturbed you may experience pain on the site. Try to avoid drinking through a straw, heavy activity like exercise or lifting, eating hot or spicy food for the next 48 hours. Smoking, brushing the extraction site and rinsing roughly can also affect the extraction site. You may brush and floss the rest of your teeth but not the site. You can begin rinsing after 48 hours of the extraction. You may also experience swelling after an extraction. Here are a few ways you can reduce the swelling. Apply a cold ice pack or bag on the side of the swelling firmly this can prevent or lower swelling. When you apply remember to hold on the site for about 20 minutes on and 20 minutes off. It is important to not to skip meals after an extraction, avoid nuts, sunflower seeds, popcorn, these foods can get stuck on the extraction site. It is a good idea to eat soft cold foods, sandwich, yogurt etc. continue until you can gradually begin to eat on both sides of the mouth. If you experience pain after extraction it is important to take the medication that was prescribe after the dental extraction. It is a good idea to take the pain medication before the numbness wears away after your dental extraction you will manage any discomfort better. The amount of pain medication should be less each day after the extraction. 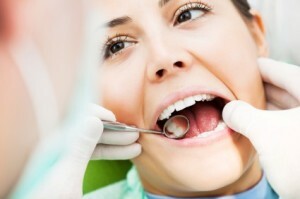 It is very important to contact your treating dentist if you find that you are taking large amount of pain medication. The healing process of a dental extraction should minimize day by day, it takes a few weeks for the site to completely close. The first two days are usually the most uncomfortable, after the third day you should be more comfortable. If you keep experiencing pain or heavy bleeding after a few days, contact your treating dentist as soon as possible. They can prescribe you a different medication or check the extraction site to make sure everything is healing correctly. Please follow the instructions your dentist recommends and take any medication as indicated by your dentist. This will make the healing process more comfortable and fast. If you have any questions regarding extractions you can contact your friendly staff at Smiles on Bristol Dentistry. This entry was posted in Uncategorized and tagged extraction, extractions, post op instructions, santa ana dentist, Smiles on Bristol on December 11, 2015 by Francisco Torres. What are dental sealants? Sealants are a thin plastic coating that is used seal the pits and fissures so that no bacteria has access to grow in the tooth. These dental sealants are a protection for the tooth’s health, because they are used to seal out both food and plaque. The number one candidates for these dental sealants are kids and teens, because of the likelihood of obtaining tooth decay at a young age. Not only are kids and teens candidates for these sealants but also adults can benefit from obtaining sealants as it works as protection for the pits and fissures. Dental sealants are an easy and fast treatment. The sealant will be painted on the grooves of the occlusal part of the tooth enamel, as it bonds with the tooth it will create a wall that will protect the grooves( pits and fissures) of all the chewing surfaces. The sealants acting as a barrier will keep plaque and sticky food away from the chewing surface of the tooth. This prevents future caries on the teeth. This is a perfect preventative measure to avoid dental decay. The cost of the sealants it’s less than a one surface dental filling. The procedure for dental sealants is very fast and painless. The procedure begins with a regular cleaning (prophylaxis) making sure there is no plaque on the chewing surface of the tooth, then the tooth is dried and some etch is placed, this roughens the surface so that the sealant material can bond to the tooth. The etch is left for about 20 seconds and then is rinsed with water, after the etch the sealant is placed on the pit and fissures of the tooth, a curing light is then used on the sealant material, this will set the sealant. The occlusion is then checked to make sure the occlusion is normal. Dental Sealants are not for all patients. Dental sealants are only applicable on teeth that don’t have caries or existing dental fillings. Sealants are mostly placed on molars and premolars, there are some exceptions were they are place on the lingual part of an anterior tooth (front teeth). This is only when the lingual part of the tooth is deep and is prone to caries. The best way to see if you’re a candidate for dental sealants is to schedule a dental exam. If you have any questions you can always contact your friendly staff at Smiles on Bristol Dentistry. This entry was posted in Uncategorized and tagged santa ana dentist, Sealants, Smiles on Bristol on December 10, 2015 by Francisco Torres. Pregnancy is one of the most wonderful and fulfilling life experiences! However, as delightful of a time it may be for the mother-to-be, she must be aware that the changes occurring throughout the pregnancy can affect her oral health. Studies show one of the most common oral hygiene issues women experience is pregnancy gingivitis. Almost all pregnant women will experience some form of gingivitis during their nine months of pregnancy. Generally, it begins in the second month. The mouth and gums of a healthy adult, who is not pregnant, handles gingivitis differently than an adult who is expecting. The hormonal changes can cause the expectant mother’s mouth to deal with the plaque buildup on the teeth differently, ultimately irritating the gums. The hormonal changes exaggerate the body’s reaction to the plaque, which is why pregnancy gingivitis is so common. Symptoms include red, inflamed or bleeding gums. The best time to schedule the first dental visit during pregnancy is between the fourth and sixth months. Typically, the first three months of the pregnancy do not require specific dental attention. It’s best to notify your dental office of the pregnancy prior to the visit so the doctor is fully prepared. As always, if a patient has any concerns they should inform their doctor, to determine the best coarse of action for them. Dr. Kalantari also warns expectant mothers that they should not ignore the symptoms of gingivitis. The bacteria from the gingivitis can enter the mother’s bloodstream through her gums. From there, the bacteria makes its way through the uterus, triggering multiple hazardous scenarios for the baby. Premature labor and a low birth weight are both caused by untreated gingivitis. The staff at Smiles on Bristol is available six days a week to help you schedule an appointment! Give them a call to plan your next visit to prevent pregnancy gingivitis. This entry was posted in Uncategorized and tagged Pregnancy, santa ana, Smiles on Bristol on December 9, 2015 by Francisco Torres. Dental Fillings is a type of restorations on teeth that is used to repair teeth that have fractures or tooth decay. There are many types of dental restorations, the most common are resin composite, amalgams, or porcelain fillings. Like all type of restorations there are pros and cons. The procedure is very common, first the dentist administers anesthetic on the site where the tooth will be worked on, and then the dentist will prep the tooth removing all decay, after the tooth is prep the dentist will then decide what type of dental fillings will be used. After the fill is placed the dentist will check your occlusion to make sure it’s even. The type of dental restoration that the dentist will use is based on what is best for you. Dental amalgam or silver fillings are made of metal and are used on large restorations. They produce less sensitivity for these cases, and are also the less expensive. This type of restoration usually lasts up to 15 years. Silver fillings will usually be used in molars or premolars (back teeth) they are very noticeable and are not used in visible areas. Silver fillings are being used less, due to patients not wanting metal or grey or silver fillings in their mouth. Amalgam fills also causes discoloration on the surrounding tooth structure were placed. Composite fillings are made of a resin. This type of restoration is the most popular because it matches the tooth color. Composite fillings are ideal on small restorations or anterior (front teeth). In most cases people don’t know you have restorations. The preparation for resin fillings require to remove less tooth structure. Composite fillings are not recommend for large restorations, patients are expected to feel sensitivity for a couple days sometimes weeks. Composite fillings can stain and need to be replaced more often than the amalgam filling. There can be many types of porcelain restorations. Crown, bridges, veneers, onlays, inlays are some examples. Porcelain fillings just include onlays and inlays. Inlays replace the chewing surface of a tooth, and onlays can replace chewing surface and the cusps. When your dentists prepares the tooth for an onlay or inlay they remove all decay and remove more tooth structure for the onlay or inlay to fit. Onlays and inlays are fabricated in the lab to fit the preparation site of your tooth. This type of porcelain filling can last up to 30 years. The cost is more expensive that a traditional composite or amalgam fill. With any type of dental fillings there can be some sensitivity issue, this usually last a couple days and tends to go away. You shouldn’t experience any pain from your tooth after dental fillings. If you do experience any pain and it doesn’t go away it’s usually that the nerve is affected. You should return to your treating dentists to double check the filling. The way to maintain your new filling no matter the type of restoration is by brushing and flossing. This will remove any plaque and stop recurrent decay. It’s always a good idea to have your regular check up’s and cleanings. This entry was posted in Uncategorized and tagged Dental fillings, santa ana dentist, Smiles on Bristol on December 9, 2015 by Francisco Torres. Veneers are a thin custom layer shell fabricated to cover the facial or front side of your tooth. 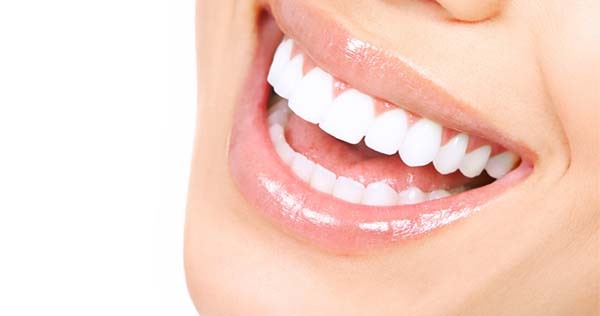 Veneers can change the color, length, shape, and size of your teeth. Improving the look of your teeth. There is two options for veneers porcelain or composite veneers. Composite veneers can be fabricated in office. Porcelain veneers will usually be sent to a lab for fabrication. Veneers are usually diagnose on teeth that have lost color, chipped teeth, teeth that have gaps between them, or some misaligned teeth. Veneers are considered cosmetic treatment, because in some cases it just improves the aesthetics of a tooth. The treatment for veneers is similar to a preparation of a crown, the only difference is the amount of tooth that is being shaved is less. The small amount of shaving of the tooth is necessary this creates retention for the permanent veneer to sit. After the preparation a final impression will be taken to fabricate the veneer. Then they will fabricated a temporary veneer or fabricated your composite veneer. The temporary veneer can fall off due to that is cemented with a temporary crown, if this is the case it is very important to return to your treating dentist to fabricate a new temporary crown. It is recommended to return to your dentist as soon as possible because you may experience sensitivity or the final veneer will not fit correctly. After the veneer is cemented your dentist may recommend you to avoid food or drinks that stain teeth such as coffee, teas, or carbonated drinks. There is other alternatives to dental veneers, such as a crown or regular dental fillings.Some veneers may fracture or fall it is important to have regular dental check up’s to make sure the veneers are functioning properly. This entry was posted in Uncategorized and tagged santa ana dentist, Smiles on Bristol, Veneers on December 8, 2015 by Francisco Torres.